The conceptual and operational work of the Hanns Seidel Foundation is concentrated primarily in four departments. Whilst the Academy for Politics and Current Affairs focuses on current trends and scholarly research, the Institute for Political Education offers seminars on a number of different topics. The Institute for Scholarship Programmes fosters up-and-coming researchers with programmes that benefit talented academics who are socially committed. The Institute for International Cooperation operates and evaluates development cooperation projects. The main focus here is good governance, poverty reduction and sustainable development. The Central Services division provides these four departments with support as a service provider. 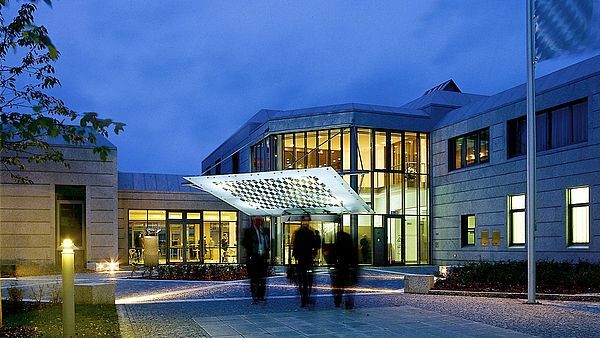 The Banz Monastery Educational Centre and the Conference Centre at the foundation’s headquarters in Munich represent places to meet and engage in dialogue. The overarching guidelines governing the foundation’s work include the relationship between citizens and the state and the tension between globalisation and regionalisation. Here too, the focus is on the new role of Germany and Europe in light of international conflicts and migration, the impact of the increasing individualisation of society and questions of responsibility for future generations. The Hanns Seidel Foundation has belonged to this family of foundations since 1967. It was named after the former Bavarian prime minister and CSU chairman. It is politically aligned with the Christian Social Union and engages in political education with the aim of promoting the democratic and civic education of the German people on Christian foundations. Its educational programmes extend beyond party boundaries and are open to all interested citizens. Its commitment to democracy, peace and development abroad also rests on these foundations. In addition, the practical actions the foundation engages in focus on standards of human dignity and tolerance, freedom and responsibility, solidarity and sustainability, equality of opportunity and intergenerational justice as well as subsidiarity as a principle of responsibility and structure. A broad range of tasks has developed over the past five decades from its original mission and purpose. This includes dialogue between the spheres of politics, science, business and society as well as engaging in future-related issues, developing strategies to face national and international challenges, teaching and practising political skills, knowledge and abilities, supporting gifted and socio-politically committed students at home and abroad, and promoting international understanding and global development cooperation.